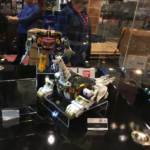 Straight from New York Comic Con and the Bluefin Tamashii Nations booth is our first look at the Super Mini-Pla Titanus! Recently revealed as King Brachion via a Premium Bandai pre-order in Japan, this is the first hint that the Super Mini-Pla King Brachion may be brought over to the US under the Titanus name. Super Mini-Pla King Brachion is one of the largest Super Mini-Pla sets to release and is motorized to act like the original, deluxe sized version. Currently, Super Mini-Pla Titanus is “Display Only”, and we will follow up with Bluefin Tamashii Nations to see if we can have any hint of an upcoming US release. For those unfamiliar with Mini-Pla or Super Mini-Pla – it’s a model kit, much like Gundam model kits, where you build the figure yourself. The difference between Mini-Pla and Super Mini-Pla, other than the size (Super Mini-Pla is larger), is that many pieces come pre-painted or pre-stickered. 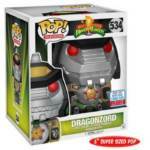 The Super Mini-Pla Daizyujin and Dragon Caesar (aka Megazord and Dragonzord) have already been released in Japan and are releasing for the first time at New York Comic Con as the Megazord and Dragonzord. Special thanks to our friend @dekablue25 who is currently at New York Comic Con. Check out the original tweet below. At this year’s upcoming New York Comic Con 2017 the cast of Power Rangers Ninja Steel will appear at the show! Peter Sudarso had recently stated that the plans for the 25th Anniversary of Power Rangers would be revealed at the show and with the appearance of the cast this only leans towards confirming that statement. Stay tuned to TokuNation.com as we will be in attendance at the show with all your news, images, and details! Another New York Comic Con has come and gone and 2016 was another busy year! Our team hit the ground hard starting Wednesday night at Hasbro’s “Twas the Night Before…” event, and continued in to an all-day coverage attack on Thursday! And while the majority of our team left after Thursday, we still had our secret weapon in attendance … our very own Sentai Tamashii/@SoulInkChu! He managed to run through some of the smaller portions of the event and got us even more coverage and spent time talking to various companies along the way. Take a trip down (recent) memory lane with our complete, network-wide New York Comic Con 2016 Complete Post-Show Coverage round-up! Thank you to everyone who participated in sharing our coverage and joining in our discussions. We do these shows at our own expense – we’re not sponsored by any company, every dime spent is our own dime! We’ll see you at our next covered event – Toy Fair 2017!